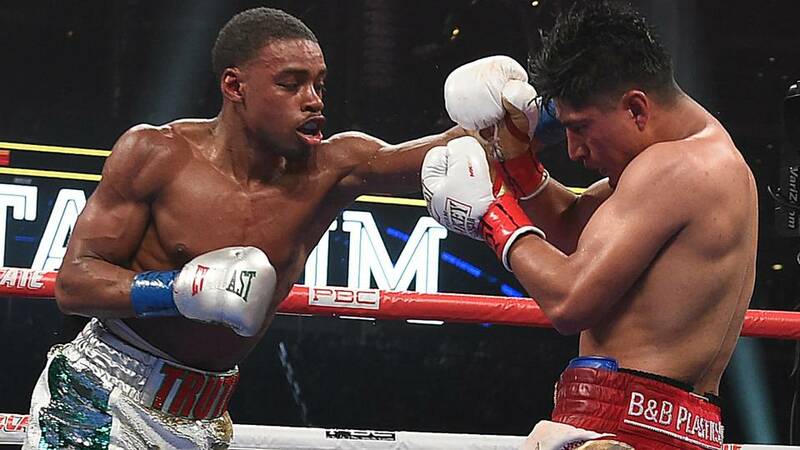 IBF welterweight champion Errol Spence Jr 25-0 (21) delivered a beatdown to WBC lightweight champion Mikey Garcia 39-1 (30) over twelve progressively one-sided rounds at the AT&T Stadium in Arlington, Texas on Saturday night. Southpaw Spence displayed an educated jab, consistent body work and a variety of left crosses to dominate the action throughout the fight. All three judges viewed the fight as a shutout with scores of 120-117, 120-118 and 120-118. Garcia was never able to find his range or rhythm and struggled to mount any meaningful offence for much of the fight. Spence threw a career-high 1082 punches and outlanded Garcia by a remarkable 345 to 75 margin – or 460%. “So many so-called experts were writing me off. Tonight I just wanted to show that I do have boxing ability. I can box. I can use my jab. I do have a high boxing IQ. There was a reason I was an Olympian and wanted to prove I could do that,” the 29-year-old Spence said. Spence increased the pressure with each round. In the eighth he had Garcia bleeding from the nose and after a hellacious the ninth round that saw the 31-year-old Californian was battered from pillar to post a stoppage looked imminent. “Mikey has a lot of heart. He prides himself on being a tough Mexican fighter. He didn’t want a stoppage,” Spence said. Trainer Derrick James praised Spence for his discipline in sticking to the gameplan. “The jab was the key element. Told him to keep the jab in his face so he has to think,” James said. During the lead-up to the fight Spence said he took umbrage at former fighters who tipped Garcia to win. “I felt insulted during training camp that people were saying he was smarter than me and I felt insulted that a lot of these reporters were agreeing with them,” Spence said. “Top guys like ‘Sugar’ Ray Leonard and other guys were going for Mikey Garcia. Guys like [Juan Manuel] Marquez and [Marco Antonio] Barrera were going for him. [Mike] Tyson and Leonard saying Mikey Garcia was going to win and that kinda rubbed me wrong too. Former eight-division world champion Manny Pacquiao 61-7-2 (39) joined Spence in the ring after the bout with the Texan calling for a fight with the still-popular 40-year-old Filipino. “If Manny Pacquiao doesn’t want to fight, I’ll smoke [WBC welterweight champion] Shawn [Porter] too,” Spence said.